Edit: Chase is changing its current Freedom 10 and 10 program. You will no longer earn 10% extra points per $1 spent, nor will you earn a 10 bonus points on every purchase you make with your Freedom card. You will now earn a 10% annual points bonus on all points earned. As I’ve already mentioned before, I love Chase national bank. If you want to hold off on the Chase Sapphire Preferred card, that’s okay for now. I do highly recommend having a Chase checking account and Freedom credit card. The two make an awesome duo. Having both a Chase checking account and the Chase Freedom credit card automatically enrolls you into the Chase 10 and 10 program. You will need both accounts to gain these features. This is in addition to the normal 1% cash back you earn with normal spending as well as the 5% quarterly bonus on rotating category spending. If you open up a Chase Checking account before applying for the Chase Freedom card, within 90 days of having both accounts, your Chase Freedom credit card automatically converts to the 10 and 10 Exclusives card. If you spend $100, you will get the normal 100 points in addition to 10% more, which equals 110 points. You will also get an extra 10 bonus points for a total of 120 points. This turns into a 1.2% cash back reward. If you spend $1, you will get the normal 1 point plus an extra 10% more, which equals 1.1 points. You will also get an extra 10 bonus points for a total of 11.1 points. This turns such a purchase into a 11.1% reward. As you can see, this card works best for small purchases. Also, these examples don’t account for the additional points you earn when your card earns 5% cash back. 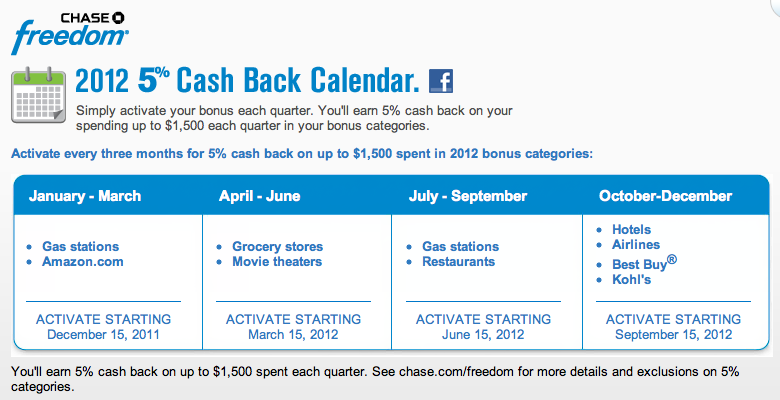 Here's a picture that shows these 5% bonus cash back categories for the rest of the year. If you have a Chase Sapphire Preferred card, you can then transfer all of these bonus points you’re making from the Freedom card into the same account. Only with the Sapphire Preferred card can you transfer these points to compatible airlines for travel benefits. When you spend money, make sure you're maximizing the available points.